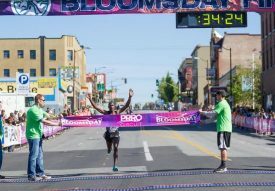 SPOKANE, Wash. – The Lilac Bloomsday Run 12K, on Sunday, May 6 will open the 2018-19 PRRO Circuit racing season. The PRRO Circuit showcases world class competition at four classic American road race events shorter than the marathon distance and offers more than $330,000 in guaranteed prize money overall with $109,500 available for U.S. athletes. The iconic U.S. road race that attracts 45,000 participants annually will also host the 2019 PRRO Championship on May 5. The 2018 Bloomsday will award an overall Open prize purse totaling $50,000 that goes 15-deep with each race champion taking home $7000 as well as a $20,000 American-only purse. In addition, the 42nd Bloomsday winners will qualify for the $10,000 PRRO Super Bonus available at the 2019 PRRO Championship. “We’re looking forward to opening the new PRRO Circuit season and we’re also excited about presenting the PRRO Championship race for our second time in May 2019,” said Don Kardong, Lilac Bloomsday Run race director and Professional Road Running Organization (PRRO) Circuit President. At the 24th PRRO Championship, reigning PRRO champions and any athlete who has won at least one of the 2018-19 Circuit events are eligible for the $10,000 PRRO Super Bonus, which is awarded to the winner of the 2019 PRRO Championship (split if an eligible male and female win the PRRO titles). Those aforementioned runners are also eligible for the PRRO Event Champion’s Bonus ($1500 cumulative for eligible athletes who do not win the PRRO Championship but do place in the top 10 at the PRRO Championship). Any athlete who wins the PRRO Super Bonus is not eligible for the PRRO Event Champion’s Bonus. The PRRO Circuit, a long-time pioneer and champion of a clean sport, has funded drug testing at its events since 2006. During the 2017-18 season, there were more than 50 in-competition tests and an undisclosed number of pre-competition tests. The PRRO Circuit, launched in 1995, starts and finishes the Circuit Year at the same event that will also host the season ending PRRO Championship race. The reigning titlists of the PRRO Championship and the event winners on the current Circuit are eligible for the PRRO Super Bonus at the PRRO Championship.